Trust is an unincorporated community in Madison County, North Carolina. Centered at the intersection of NC 63 and NC 209, the community spreads along the adjacent Spring and Friezeland creeks, north of Luck. The community is part of the Asheville Metropolitan Statistical Area. The origin of the name "Trust" is obscure. 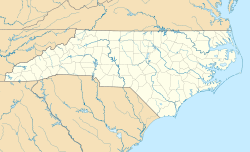 ^ Madison County, North Carolina (PDF) (Map). Cartography by NCDOT. Raleigh: North Carolina Department of Transportation. September 2015. Retrieved April 7, 2016. ^ Moyer, Armond; Moyer, Winifred (1958). The origins of unusual place-names. Keystone Pub. Associates. pp. 141–143. This article about a location in Madison County, North Carolina is a stub. You can help Wikipedia by expanding it. This page was last edited on 16 January 2018, at 07:16 (UTC).